When my grandma taught me to knit, three decades ago, she couldn’t have guessed how important it would become in my life. I remember knitting scarves full of dropped stitches, and telling grandma: “I can knit with my eyes closed!” Knitting was something I did with my grandmother, and when we moved from the outskirts of Lisbon, Portugal, to live in Macau, South of China, I didn’t pick up the needles again. Adolescence struck, along with the 90s, and knitting faded to the background, giving way to checked shirts and Doc Martens boots. 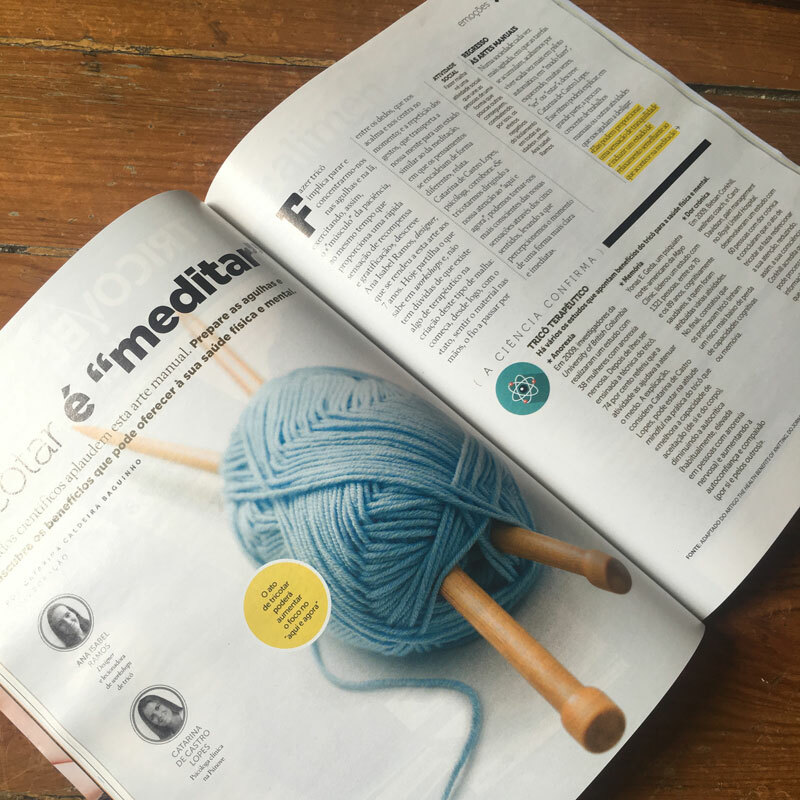 It wasn’t until my late twenties, when I was living in Buenos Aires, Argentina, that I thought about knitting again. With some basics from my mom and a yarn shop near my apartment, soon I was using knitting needles again. Ravelry, a social network for knitters and crocheters, had been just launched, and through it I met people and made new friends. I have moved twice since those days, and I still treasure knitting as a way to improve my well-being. Sharing that joy is what led me to start teaching others how to knit. 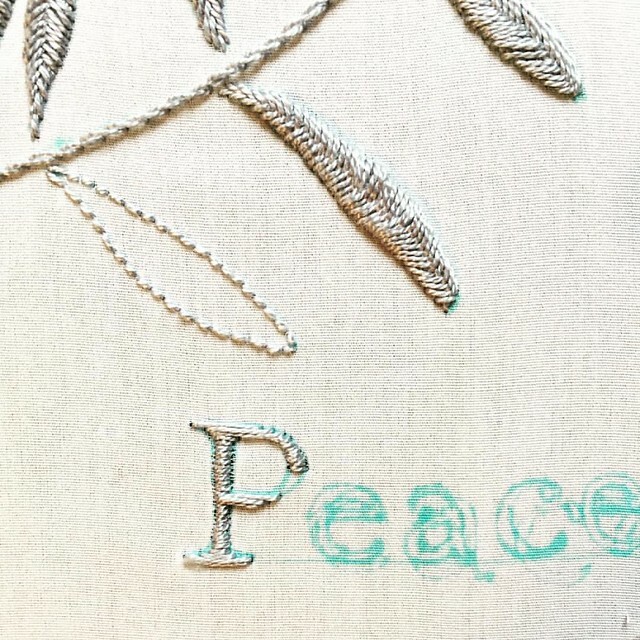 We gather in small groups, on Saturday mornings, between yarn and needles, talking all things stitches. Students arrive early in the morning, a bit nervous and shy. Some apologize in advance, believing they might not be able to learn; they feel it must be difficult to turn a single thread into a solid piece of fabric. We start by winding the yarn and casting on, allowing our hands, not our minds, to learn the gestures. We wrap the yarn around our fingers and behind the neck, as our grandmothers did, and we start purling. Stitch by stitch, we work through the row. When purling becomes easy, we go on to knitting, then ribbing. 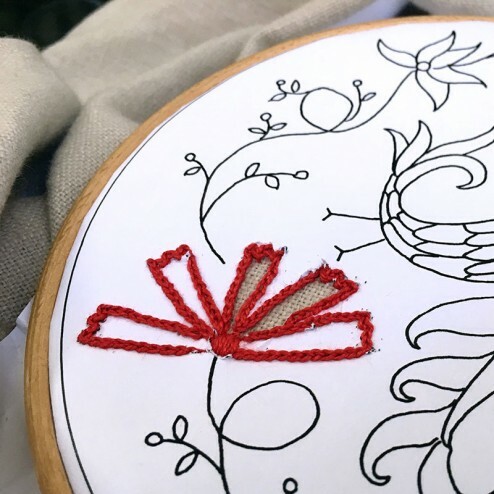 Amid childhood memories of a grandmother or aunt who made booties or a scarf, a small miracle happens: with a pair of sticks and a bit of thread, fabric starts to grow out of the needles. That is the point of no return, when students realize they, too, can make something out of nothing. 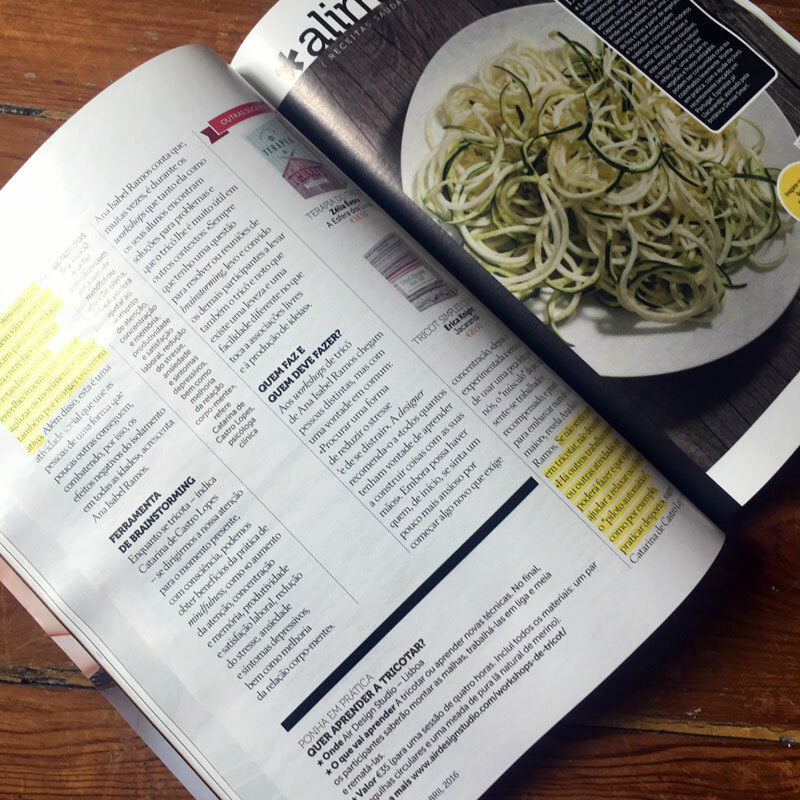 Being part of this small miracle brings a sense of community to everyone in the room. 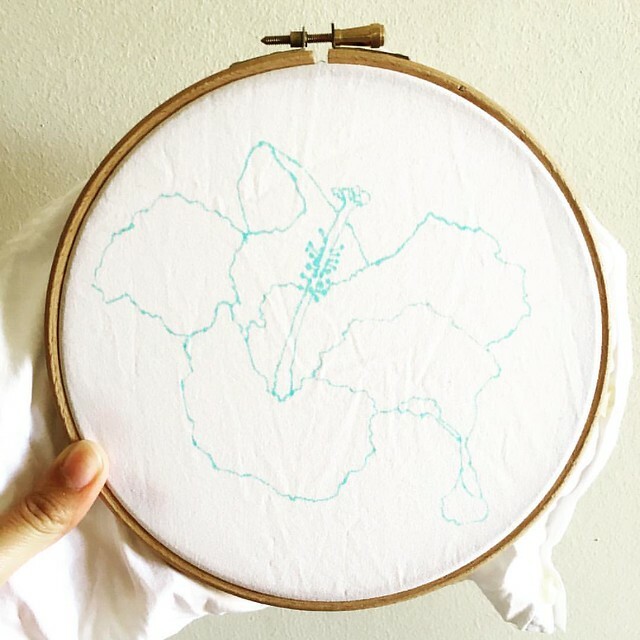 We now have a common thread that connects us, one that is defined by slowing down and taking the time to make things with our own two hands. We become partners in a slow process, one that allows time for thought, movement and creativity. 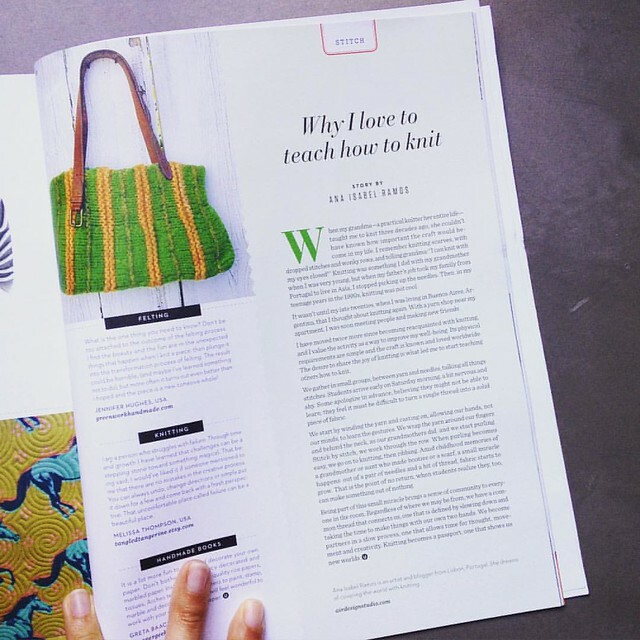 Knitting becomes a “passport”, one that shows us new worlds. Last Saturday, January 9th, was one of those days. We shared a morning learning, connecting, recovering childhood memories and remembering those who knitted around us when we were just kids. Quando a minha avó materna me ensinou a tricotar, há três décadas, não poderia imaginar a importância que iria ter, mais tarde, na minha vida. Lembro-me de tricotar cachecóis intermináveis em liga, cheios de malhas caídas, e anunciar, feliz e orgulhosa, que já sabia tricotar de olhos fechados! A malha era algo que fazia com a minha avó, e quando nos mudámos dos arredores de Lisboa para a nossa nova vida em Macau, não voltei a pegar nas agulhas. Veio a adolescência, chegaram os anos 90, e o grunge, as camisas aos quadrados e as botas Doc Martens ocuparam o panorama. O tricot, esse, perdeu-se na penumbra da memória. Só na segunda metade dos meus vintes, já a viver em Buenos Aires, na Argentina, é que voltei a pensar no assunto. Com umas lições da minha mãe e uma loja de lãs perto de casa, passado pouco tempo estava a tricotar. 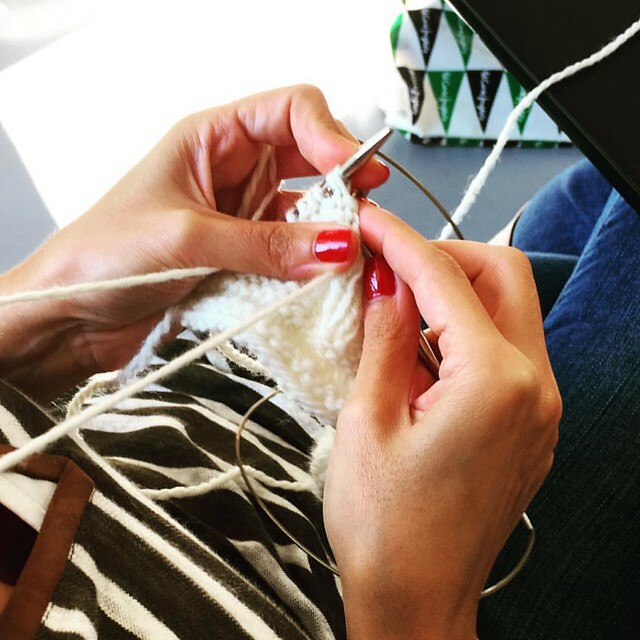 Nessa altura surgiu também o Ravelry, uma rede social de tricot e crochet, que me permitiu conhecer mais pessoas e fazer amigos na minha nova cidade. Desde então já me mudei duas vezes, e continuo a considerar o tricot como uma excelente forma de promover o meu bem-estar. Partilhar a alegria que o tricot me traz foi o que me levou a organizar workshops de tricot e a ensinar pessoas a tricotar. Juntamo-nos em pequenos grupos, ao Sábado de manhã, e entre lã e agulhas se passa o tempo. Os alunos chegam cedo, por vezes nervosos, um pouco envergonhados. Alguns começam por pedir desculpa, pensam que provavelmente não irão conseguir aprender; muitos acreditam que transformar um simples fio em tecido deve ser demasiado complicado para aprender. Começamos por dobar as meadas em novelos, e depois montar as malhas. São as mãos, e não o intelecto, que têm que aprender o movimento. Depois passamos o fio à volta do pescoço, tal como faziam as nossas avós, e começamos a aprender a fazer liga. Malha a malha, avançamos pela agulha até chegar ao final da carreira. Quando a liga se torna fácil, passamos à meia, e daí ao canelado. Entre memórias da avó ou da tia que tricotava (ou, no meu caso, dos relatos do avô que fazia as suas próprias meias), acontece um pequeno milagre: com apenas um par de agulhas e um fio começa a crescer tecido debaixo das agulhas. E esse é ponto sem retorno, o ponto em que os alunos se apercebem de que também eles podem criar algo a partir do nada. Ser parte deste pequeno milagre traz uma sensação de comunhão, de partilha de algo especial como todos os que ali estamos. Temos um fio que nos liga uns aos outros e que se define por conscientemente abrandarmos e nos deleitarmos com o prazer de podermos criar novos projectos com as nossas próprias mãos. Tornamo-nos parceiros num processo lento, que pelas suas características nos permite abrandar, ter tempo para pensar, para deixar a mente deambular, para criar. O tricot transforma-se num “passaporte” que nos abre novos mundos. I’m reading Sheryl Sandberg and Nelly Scovell’s wonderful, mind-opening book “Lean in”. If you’ve never heard of it, it is about women and leadership, and the imbalance at the top level, and women’s responsibility in maintaining – and changing – the status quo. As soon as I started reading it, I got hooked. I have recommended it to friends and mentioned it to everyone around me, it should be compulsory reading to everyone, women and men alike. There are so many interesting points in that book, but today I’m going to address only one: the question of being assertive and wanting to be liked. The authors quote a study made in the US where a group of people was divided in two parts. Then, one of these groups received the profile and list of abilities of a person named “Heidi”. The other group received the exact same profile, but instead of “Heidi”, this fictional person was called “Howard”. Remember: Howard and Heidi have the exact same profile. What have scientists discovered? Both men and women believe “Howard” to be a great colleague, a nice person, a good leader. “Heidi”, on the other hand, is perceived as aggressive, arrogant, not nice (and by “not nice”, imagine “bitchy”, and so on). But can you see what is essential here? It’s that both men and women perceive “Heidi” to be disagreeable, while “Howard” would be a great colleague. This means that we, women, are not innocent victims of this double standard: we are part of the problem! We are conditioned to be soft, gentle, nurturing, adorable since we are young girls. We are conditioned to be quiet, blend in, tone down what we are certain about, obviously never mention our victories (which makes us believe these victories aren’t that great anyway). Speaking about our accomplishments makes us come across as arrogant, aggressive, and it sounds like we’re bragging. When I read this, my heart jumped with the scare it got: I am part of this group! I am so afraid of not being liked that I do shut up often when I know I’m right. I shut up because I don’t want to come across as too critical, too assertive, too aggressive, as it may bother the people around me. Silly? Of course it is! But it is also very real. Take what happened the other day, when I went shopping for circular knitting needles for my knitting workshop students. I always like to provide my students with the best quality materials, even if a little more expensive than basic ones. I invest in good circular needles, and a wonderfully soft merino wool. I believe that when we start learning a new activity with good quality materials, we are more likely to have pleasure using them and more likely to take to it and keep doing what we just learned. I was at the haberdasher’s and asked for the circular needles in the size I wanted, and the shop lady, very kindly, brought some needles of a brand I don’t like. I have bought those needles in the past, tried them, and I don’t like them. 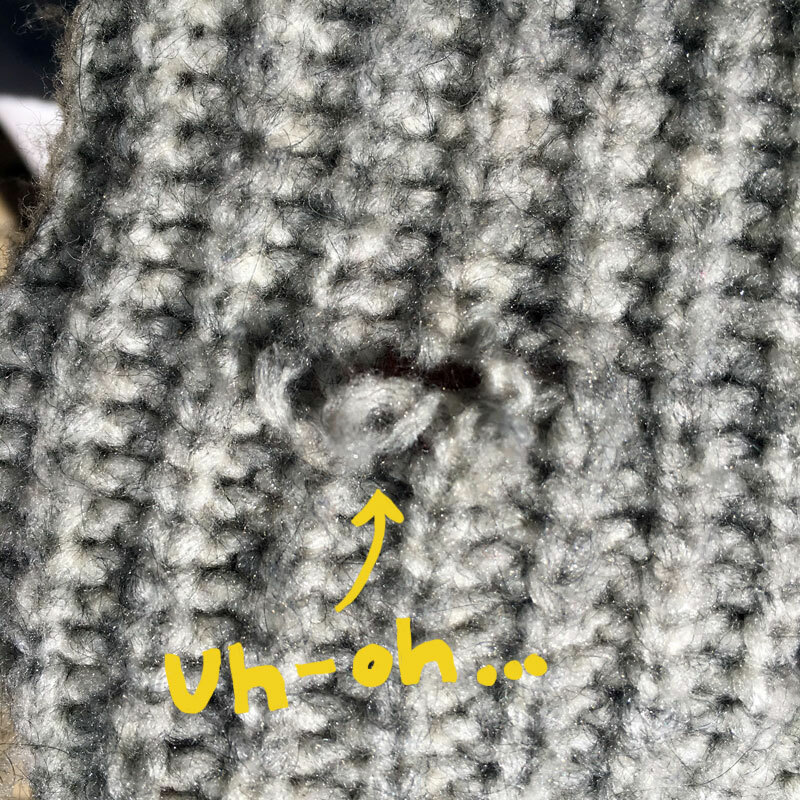 I know that stitches get caught in the joints between the cable and the needles, and that’s the kind of barrier a first time knitter (or any knitter) does not need. So I asked her if she had any other brands. At this point, the lady tried to convince me that this brand was fantastic, it had had problems in the past but they had been fixed, that “shoppers buy them often”, that “no one has ever complained” about the needles. And she tried her best to persuade me to get those needles, she was “sure” I would like them. I asked if she would give them to me, and that way I would try them one more time, but I would not purchase something I already I didn’t like. The shop lady was so persistent she put me in the position to say no many times, each time a firmer no than before. In my head, a little voice started telling me that I was being stubborn, maybe the lady knew something I didn’t, why not give it a try? In reality, this voice was nothing more than the fear of not being “likable” making up excuses to make me say yes, even knowing that I was right to say no in the first place. I kept my “nos” and added a smile to them, not knowing that that is one of the strategies Sheryl Sandberg suggests to make a firm position feel “nicer”. I left the shop with the feeling of having just accomplished a small win: a tiny light in this dark ocean that is the fear of not being liked. And this is something I – and we – have to transport to other parts of my life, not only when I’m in the center of the question (“I’m afraid of what people may think”) as well as when we perceive other women’s actions (“that … sounds so arrogant/aggressive/bitchy”). We have to take risks and state our positions in a firm way, and we have to be gentler towards other women who are doing just that, either in leadership roles or not. Estou a ler um livro maravilhoso que se chama “Lean in”, escrito por Sheryl Sandberg e Nell Scovell. Para quem ainda não ouviu falar, este livro fala sobre a liderança no feminino, sobre a desigualdade de género que existe ao nível da liderança no tecido empresarial (norte-americano e não só) e sobre a responsabilidade que as próprias mulheres têm em relação a esse panorama. Comecei a lê-lo e é muito, muito difícil pousá-lo. Já o recomendei a amigas, já falei dele a toda a gente que me rodeia porque me parece uma leitura absolutamente essencial a todos, mulheres e homens. Há tanta coisa importante neste livro, mas hoje vou falar de uma: a questão da assertividade (necessária para liderar) e a vontade que muitas de nós, mulheres, temos de sermos “gostáveis”. As autoras falam de um estudo feito nos EUA em que o perfil de um candidato é distribuído a dois grupos diferentes. O nome que consta num dos perfis é feminino, Heidi; no outro, masculino, Howard. Mas no perfil em si nem sequer tocam. E o que descobriram os cientistas? Que tanto as mulheres como os homens interrogados acham que este “Howard” seria uma pessoa simpática, bom colega, bom líder. Já a “Heidi” – que tem exactamente o mesmo perfil! – é vista como ambiciosa, desagradável, agressiva e mais não sei quantas coisas que fazem dela uma péssima líder para a equipa. Mas notam o essencial? É que tanto as mulheres como os homens deste estudo têm esta percepção! Ou seja, nós mulheres não somos vítimas indefesas e impotentes; nós contribuímos para o problema, nós somos parte do problema. Estamos tão condicionadas para sermos suaves, gentis, adoráveis; desde pequenas que nos é transmitida a mensagem de que para sermos “gostáveis” temos de refrear o nosso entusiasmo, calar as nossas certezas, evidentemente nunca mencionar as nossas vitórias e conquistas, pois aí não só seremos desagradáveis como também convencidas e gabarolas. Ao ler isto, o meu coração saltou com o susto: eu faço parte deste grupo, tenho medo que não gostem de mim, e sim, calo-me muitas vezes, quando sei que tenho razão, com medo de ser demasiado crítica, agressiva e que possa vir a incomodar alguém com o que penso. Parvoíce? Claro que é! Mas é algo muito real e profundo. Ainda noutro dia fui fazer a volta das retrosarias da Baixa. Ia comprar pares de agulhas circulares para as minhas alunas dos workshops de tricot. Faço questão de providenciar materiais de primeira qualidade às minhas alunas: as agulhas circulares que compro são sempre boas, ainda que mais caras; e a lã que disponibilizo é uma merino muito suave. A minha convicção é que começando com bons materiais, seja em que área for, os resultados vão ser melhores e vai haver uma maior vontade de voltar a tricotar (ou pintar, ou desenhar, ou outra coisa qualquer). Estava eu na retrosaria e pedi as agulhas circulares no tamanho adequado e a senhora traz-me, simpaticamente, um par de agulhas de uma marca que eu já sei que não é boa. Já comprei agulhas daquelas e sei que as malhas se prendem na ligação entre a agulha em si e o cabo plástico. Para além de que o cabo, em si, não é suave, é até bastante rijo. Por isso perguntei-lhe se tinha outra marca que não aquela. Ao que a senhora que me atendia tratou de me convencer de que aquela marca era fantástica, que tinha de facto tido problemas, mas que já não tinha, que “as senhoras levavam muito”, que “as senhoras não se queixam”. E tentou convencer-me a levar as agulhas para experimentar. Perguntei-lhe se mas oferecia, que assim levaria, mas que não iria comprar algo que já sabia não gostar. A senhora foi tão insistente que me obrigou a dizer que não várias vezes, cada vez com mais firmeza. Dentro de mim, alguma coisa se arrepiava e me dizia que eu estava a ser teimosa, que a senhora lá devia saber, porque não experimentar? Na verdade, essa voz não era mais que o medo de não agradar e que estava a arranjar desculpas para eu ceder, mesmo sabendo que eu tinha razão. Não cedi. Aos meus “nãos”, ditos com firmeza, adicionei um sorriso, sem saber que também a autora do livro sugere o sorriso como ferramenta para suavizar uma resposta firme. Saí de lá com a sensação de ter conquistado uma pequena vitória, uma luzinha neste oceano do pânico de não agradar. E isto é algo que temos, todos!, de transportar para outras áreas da vida, não só quando somos nós no centro (“tenho medo que achem que sou má”) como quando observamos outras mulheres (“aquela … tem aquele ar convencido/agressivo/arrogante”). Temos de arriscar mais a partilhar as nossas opiniões, com firmeza; e temos de ser mais compassivos e compassivas ao observar outras mulheres, em posições de liderança, ou não. Confesso que estou curiosa por saber a vossa opinião. Por isso, cavalheiros que me lêem, que me dizem? Parece-vos um texto praticamente alienígena? Ou familiar? E as senhoras? Sentem isto? Ou não? Quero saber tudo (por comentário, mail, como quiserem). Knitting has been slow over here. It’s summer, and I dislike knitting with cotton (or linen or hemp for that matter), which leaves me with mostly cold weather fibers. I specially like knitting with wool because it is so forgiving on the hands (hello, lanolin!) and also forgiving on the result, smoothing away uneven tension after a good soak. In my case, there’s more to my slow knitting than warm weather and fiber choice. I know I’m still not up to knitting complicated patterns. You may recall that it took me a while to get back to knitting after my babies were born and my baby boy died. Life didn’t feel normal (I suppose that is true to most new mothers) and my grief was so overwhelming I hardly had any emotional space to start something, anything new. When the different pieces of the enormous jigsaw puzzle that is grief started to slowly fall in their places, I started to feel that itch, and started my baby’s blanket. I needed a simple pattern, one that didn’t require much mental space to follow, but still kept me interesting. After that blanket, which was a turning point for me, I started a cowl, the Honey Cowl, to be more precise. It took me several months to complete, but who’s counting? Certainly not me. It feels like I’m suddenly coming back to the surface of those deep, dark waters. It feels like my joy of creating, of giving life to new things, is coming back. 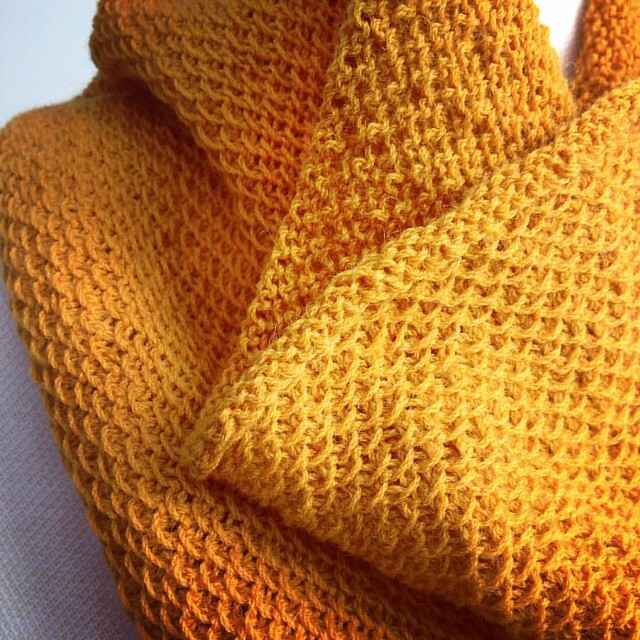 Above is my Honey Cowl, pattern by Antonia Shankland, made with Lopo Xavier’s Trianon yarn (two skeins), colorway mustard. I loved knitting it. It was intended for me, but then decided to give it to my dear friend T., who saw her life changed this summer. I wanted her to know that she is not alone, and gave her this cowl as a big hug. I hope she likes it. Next on the needles: a shawl! It’s a simple stockinette shawl (with a purl ridge to add rhythm and interest every now and then) and it’s intended for my sweetheart. I’ll share more about it later. 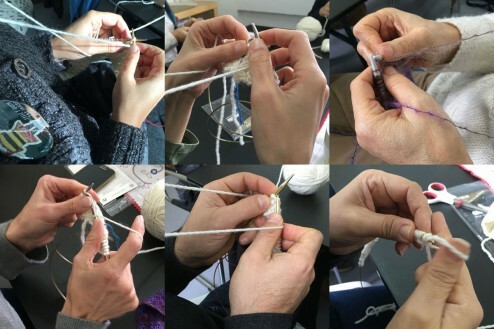 In the meantime, I added three new dates for knitting workshops here in Lisbon, this Fall. Now that the weather is cooling, it feels great to cozy up with yarn and needles in hands. Check the dates here. O tricot tem andado lento aqui pelas minhas paragens. É verão, e não aprecio tricotar com algodão (nem linho, nem cânhamo), o que me deixa com fibras mais apropriadas a temperaturas mais baixas. Entre elas, a minha favorita continua a ser a lã, não só porque não desgasta tanto as mãos (olá, lanolina!) como também porque depois de lavada atenua possíveis diferenças na tensão. No meu caso, há mais que calor e fibras quentes para justificar o meu tricot lento: ainda não tenho vontade de me atirar a projectos mais complexos. Talvez se recordem que demorei bastante tempo a voltar a tricotar depois do nascimento dos meus bebés e da morte do meu rapazote. A vida não me parecia nada normal (penso que esta é uma sensação comum a outras mães estreantes) e o meu luto era tão forte que não tinha qualquer disponibilidade mental para criar algo novo. Quando as diferentes peças deste complicado puzzle que é o luto começaram, gradualmente, a cair nos devidos sítios, comecei a sentir aquela vontade de recomeçar, de pegar nas agulhas e fazer algo novo. E foi assim que comecei, fiz e terminei a mantinha da minha bebé. Precisava de uma receita simples, que não requeresse demasiado espaço mental, mas que ao mesmo tempo me mantivesse entusiasmada. E assim foi. Ponto a ponto, comecei a sentir-me mais parecida comigo própria, à medida que a manta ia crescendo no meu colo. Depois da manta, comecei uma gola, a Honey Cowl. Levou-me meses a fazer, mas isso é pouco importante. O mais importante é que me sinto a regressar das profundezas desse lago escuro que é o luto, e a pouco e pouco, à medida que vejo o tricot a crescer-me no colo, sinto que a minha alegria de viver e de criar coisas do nada está de volta. Nas fotografias acima está a minha gola Honey Cowl, receita de Antonia Shankland, feita com duas meadas de lã Trianon da Lopo Xavier, cor mostarda. Adorei tricotar esta gola! Comecei-a para mim, mas à medida que a ia fazendo começou a surgir a imagem da minha querida amiga T., que este verão viu a sua vida revirada de cabeça para baixo. Quis oferecer-lha porque ela é linda e fofa e também para que saiba que não está sozinha! Espero que goste! Agora, nas agulhas, tenho um xaile bastante simples, desta feita para o meu querido Príncipe. Em breve partilharei mais sobre este projecto. 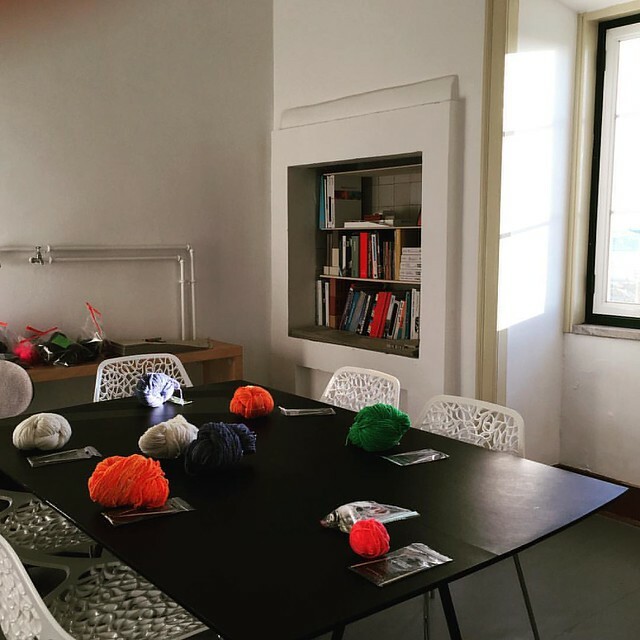 Por falar em tricot, adicionei três datas à página de workshops de tricot aqui no atelier, em Lisboa. Agora que o tempo começa a arrefecer, as agulhas voltam a chamar! Datas e inscrições aqui. An update on our ongoing fundraiser in memory of our son Daniel: it’s going strong, yay! Thank you for your help sharing the campaign’s page link and donating! With your help, we’re almost hitting our stretch goal… with two weeks to go. Please keep sharing the link (http://www.airdesignstudio.com/daniel) and donating, if you haven’t yet and feel this is a cause you want to support. Our most heartfelt thank you! Oh, the ironies of knitting! 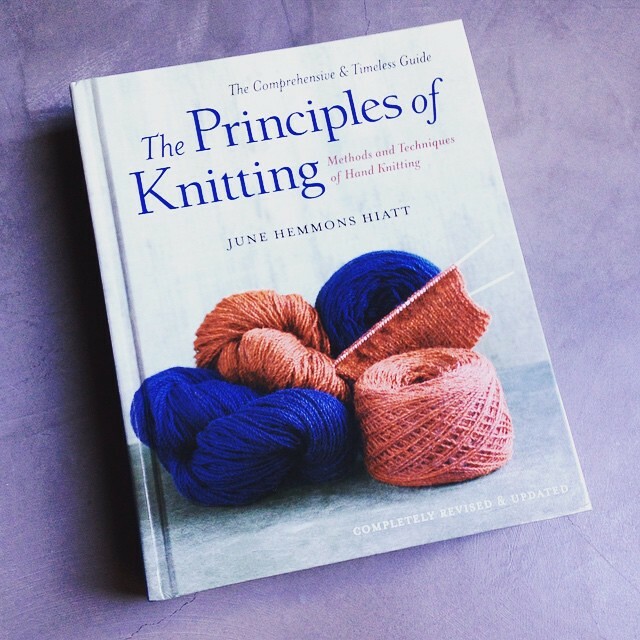 A few weeks ago I received the amazing book “The Principles of Knitting” as a gift from my dear husband (also known as “Prince” – not the famous singer) and I was delighted. It is, indeed, the bible of all things knitting, and it treats this amazing craft with the care and solemnity it deserves. Knitting may be a very easy craft to learn; it may be perceived as a craft for old ladies; it may even be perceived as something out of fashion (which it is in the first case; and is not in the second and third cases). Knitting, like English, is easy to learn, at least the basics. 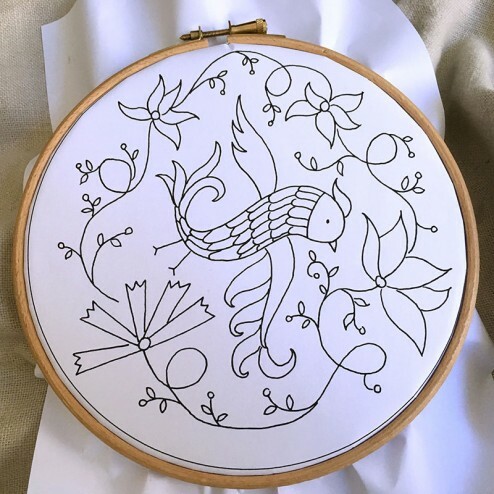 Skills like casting on and off, purling and knitting are easy to acquire (I teach them in four hour workshops), and with these basic skills knitters can make almost everything there is to make in the knitting world. But there are many advanced skills, techniques and bits of information that are accessible once you dig deeper. Very much like English, if you care for that comparison: a basic understanding gets you communicating with most of the people on the planet, but to access a larger variety of vocabulary and master idioms you must dig deeper. And that is what this book does, it digs deep on all aspects of knitting, from the history of knitting, styles of knitting, techniques, design, patterns, you name it. It was good to see that the yarn-around-the-neck style is mentioned, albeit as “Spanish” knitting. 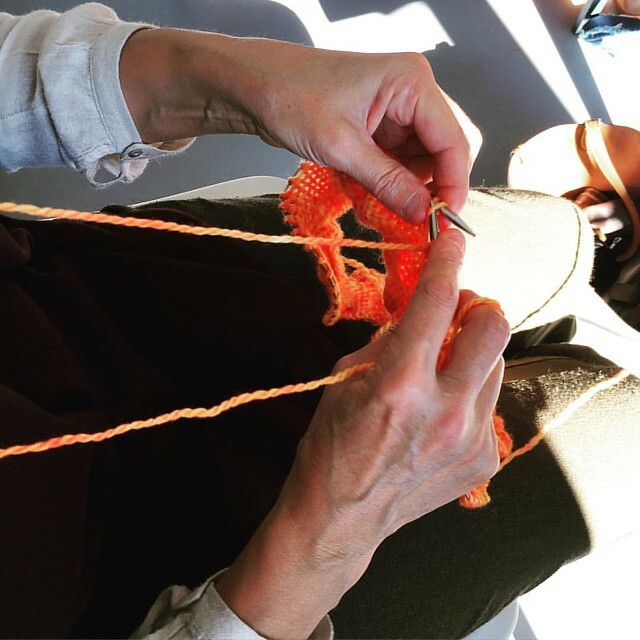 This is the way we knit in Portugal, and not the most common way to knit in Spain (it is presently very uncommon, I believe). It is also the customary way of knitting in Brazil, a country that shares a large portion of history and traditions with Portugal, and in neighboring countries like Peru and Bolivia. But the author is very careful when naming styles, saying that regional naming is not accurate; she suggests instead to name styles by the way the yarn is held. It makes sense to me! I’m currently reading the chapter on Gauge and Swatching. To give some context to the non-knitters among you, gauge is the amount of stitches and rows that fit in a certain amount of space (usually, a 4 inch or 10 cm square). Swatches are samples of the knitting pattern a knitter intends to make, to test the combination of yarn, pattern and hands. Swatches are useful to show how a certain fabric will behave before and after dressing (washing and blocking, dry cleaning or pressing), and to give you raw gauge and final gauge (before and after dressing). 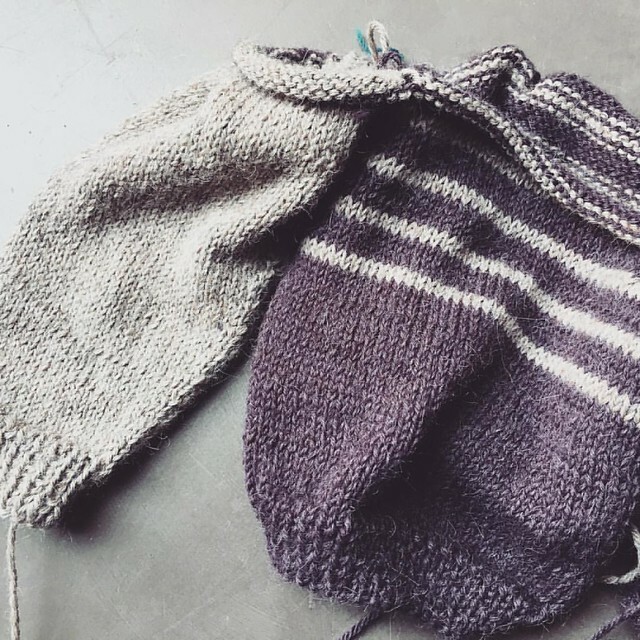 Through swatching, a knitter can gather a lot of information about the way the garment will look and feel, without investing a lot of time and money in it. 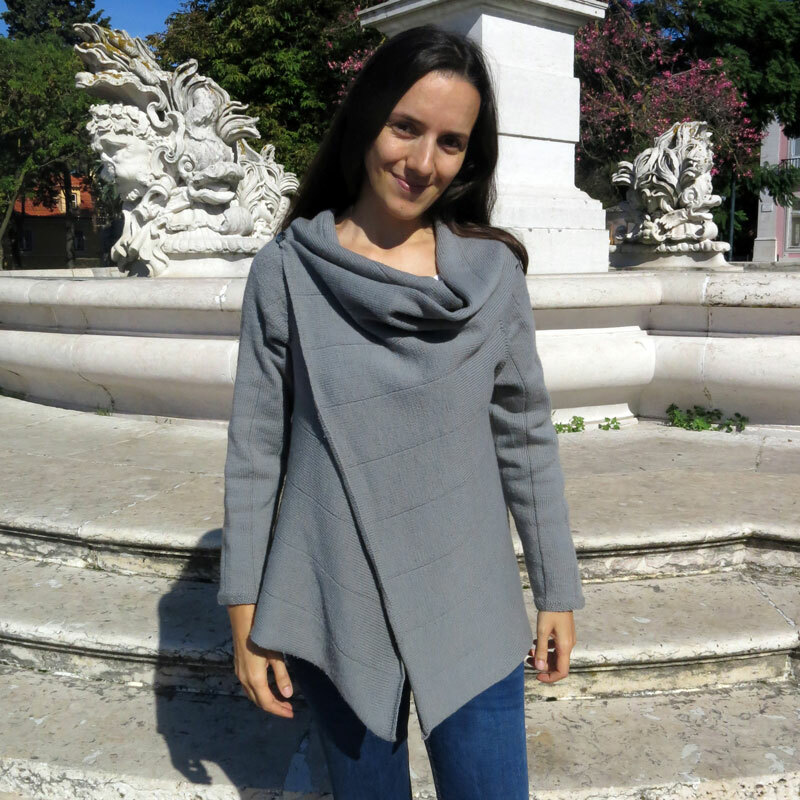 Gauge is particularly important if you intend to knit a garment where the resulting size is important, like a sweater. It is not as important if you intend to knit a shawl. The Gauge and Swatching chapter in this book has got to be the most comprehensive guide to swatching, measuring gauge and analyzing the resulting fabric I have ever read. It is incredibly rich and detailed and it makes a very powerful argument for swatching: you can test many variables with a minimum investment of time and yarn. It explains in detail all the steps from quick test swatches to a final swatch, measuring raw and final gauges, making the math to get an accurate idea of how the final garment will look. But you know what happens to many knitters (myself included)? We get impatient and when we set our minds into starting a new project, we want to start right away. So swatching and testing for gauge become a sort of obstacle… that’s why I’m not a keen swatcher. I don’t swatch with the scientific curiosity I can perceive from reading the author’s words; I swatch with dread. I want it to be over, as soon as possible. 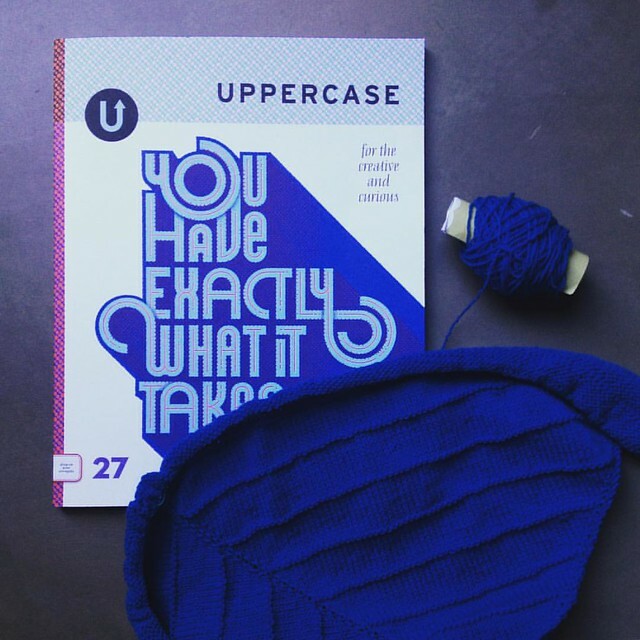 And that, my dear knitters, may or may not have rendered a few surprises in my knitting resumé. Looking at recent past projects, I have come to realize I mostly knit projects where gauge doesn’t matter too much, like a baby blanket. Or a cowl. And that’s how we get to the ironies of knitting! Because I am knitting a cowl, I didn’t care much about swatching for gauge. And the fact that I’m making my cowl with a different yarn than the one suggested, as I substituted it for a local yarn, didn’t make me change my mind. 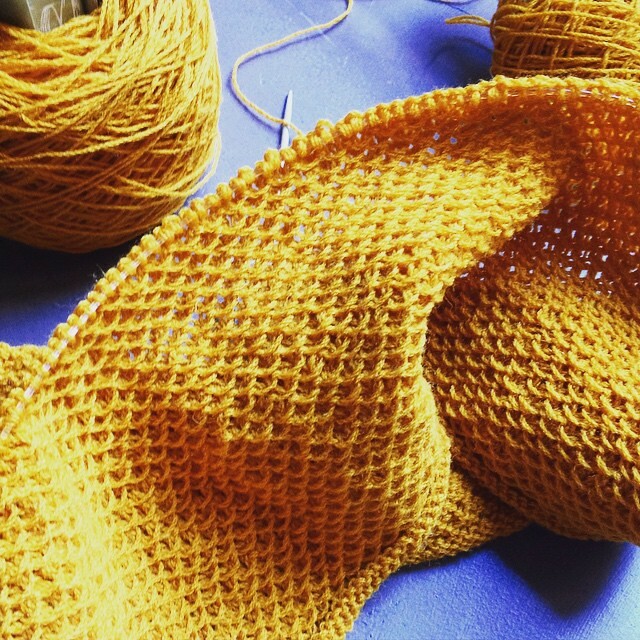 I’m knitting the Honey Cowl with the Trianon yarn from Lopo Xavier. It’s a lot thinner than the one suggested, so I went for the larger size. In its original yarn, it was supposed to be a big cowl, one that wraps twice around the neck; with this yarn, ahem, it’s a cowl that will wrap once around my head. This was clearly an example of how swatching would have been useful, even if it’s not a sweater, or a pair of socks, where final size is of extreme importance. But I didn’t do it, so I’m getting a cowl that is different than the one I imagined. To tell you the truth, I love it anyway. It seems like I can’t learn the swatching lesson! But you know what? I can. I did learn it, and the next time I plan on knitting a larger garment where fit is paramount to the success of a project, I will go back to June Hemmons Hiats’s chapter on Swatching and Gauge in the wonderful, most complete knitting reference book I’ve ever seen. How about you? Do you care about swatching? Uma actualização sobre a campanha de angariação de donativos em memória do nosso filhote Daniel: continua a decorrer, e em força! É graças a vocês que estamos quase a atingir o nosso segundo objectivo, aquele que só em sonhos iríamos atingir. Obrigada por continuarem a partilhar a página da campanha com as vossas redes, e também por nos apoiarem com os vossos donativos. Por favor, continuem a fazê-lo! Partilhem o link da página da campanha (http://www.airdesignstudio.com/daniel) e, se puderem, façam o vosso donativo. Bem hajam! 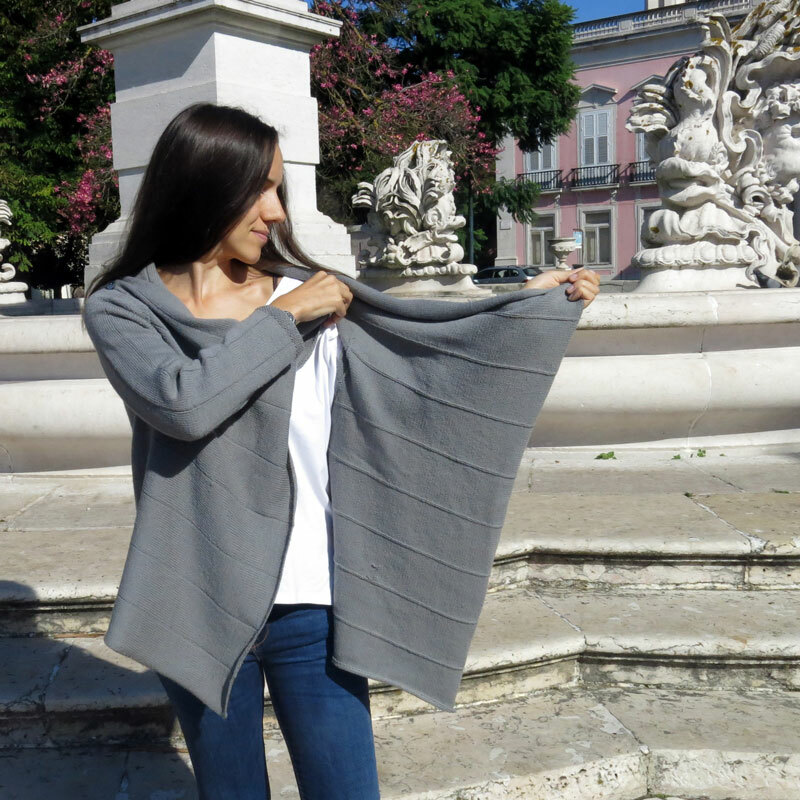 Oh, as ironias do tricot! Há umas semanas atrás, recebi, presente do meu querido Príncipe, o livro “The Principles of Knitting”. Este livro é uma bíblia do tricot, e aborda esta actividade com a solenidade e curiosidade histórica e científica que o tricot merece. A imagem do tricot ainda está rodeada de vários preconceitos. Para muitos, é uma coisa que caiu em desuso e que só as velhinhas gostam de fazer – em ambos os casos, mentira. Não só não caiu em desuso como há homens e mulheres de diferentes idades a tricotar. 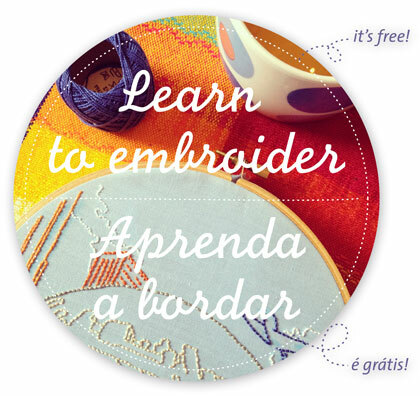 Não é difícil aprender a tricotar: adquirir os conhecimentos básicos, como montar as malhas, fazer liga, meia, elástico e rematar, são coisas que ensino nos meus workshops de tricot). 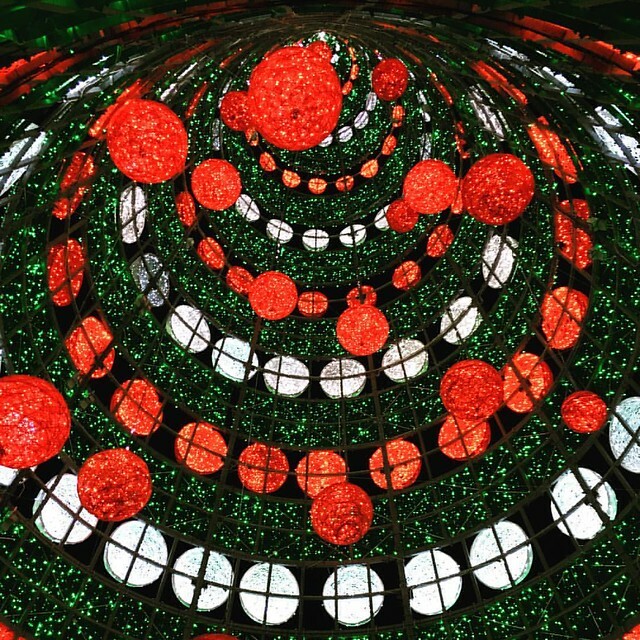 E com estes conhecimentos pode fazer-se quase tudo no mundo do tricot. Mas depois há os conhecimentos mais avançados, as técnicas, a experiência, toda aquela informação que só está disponível quando se pratica, investiga, procura. E é isso o que este livro faz: investiga, disseca a fundo tudo o que tem que ver com o tricot, com a história do tricot, os estilos, as técnicas, as receitas, a construção das peças, enfim, tudo. Foi bom constatar que a forma como tricotamos em Portugal, com o fio à volta do pescoço, ou a passar por um alfinete preso ao peito, está mencionada no livro. Curiosamente é mencionada como sendo um estilo “espanhol”. Segundo sei, em Espanha não é comum tricotar com o fio à volta do pescoço… já aqui em Portugal, bem como no Brasil e também nos seus vizinhos Perú e Bolívia, o fio à volta do pescoço é a forma mais comum de se tricotar. 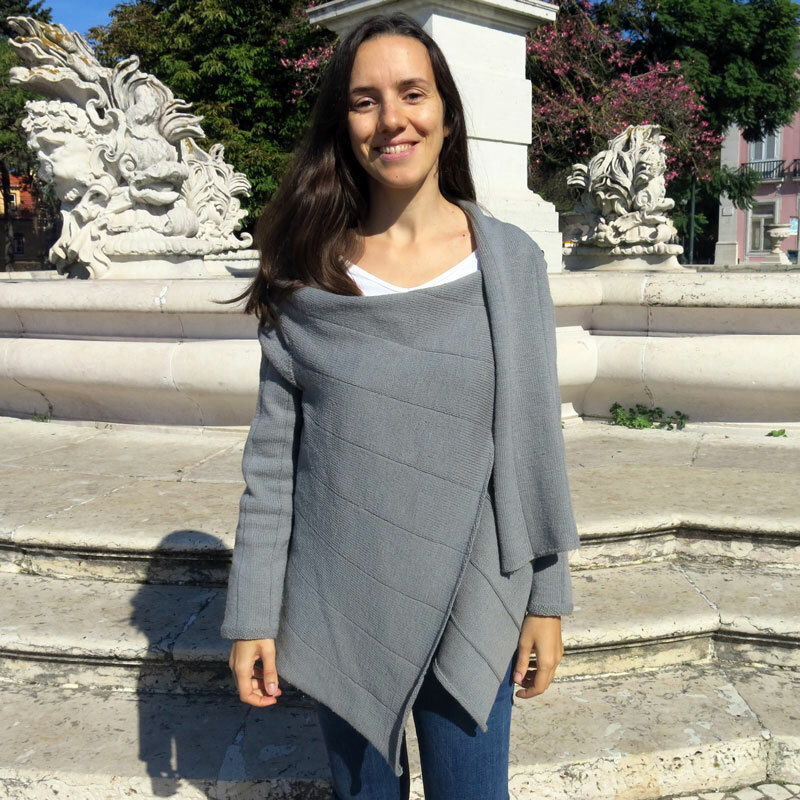 Mas a autora é cuidadosa em relação a atribuir nomes regionais aos diferentes estilos de tricot, e sugere portanto que sejam denominados pela forma como se segura o fio: com a mão esquerda, com a mão direita, atrás do pescoço. Faz sentido! Estou de momento a ler o capítulo sobre “Tensão” e Amostras. Para dar algum contexto a quem não está familiarizado com estes termos, “tensão” (ver nota acima!) refere-se ao número de malhas e de voltas que cabem num quadrado de 10 cm de lado. As amostras são isso mesmo: pequenas amostras que são feitas para testar a combinação entre as variáveis fio, padrão e mãos. As amostras são muito úteis por facultarem informação sobre como é que o tecido final se irá comportar antes, durante e depois do seu tratamento (lavagem, limpeza a seco ou pressionando suavemente com o ferro à temperatura adequada para o fio em questão). Também são fundamentais para se apurar a “tensão” antes e depois do tratamento escolhido. Com um investimento relativamente pequeno de tempo e de dinheiro, as amostras dão indicações bastante importantes sobre como a peça final resultará. A “tensão” é particularmente importante quando se planeia uma peça como uma camisola, ou um par de meias, onde uma variação de tamanho poderá significar que simplesmente não serve; e é menos importante numa peça como um xaile, ou uma manta de bebé, onde uma variação de tamanho não terá um impacto significativo no resultado final. Este capítulo deve ser o mais detalhado, estudado e cuidadoso texto sobre “tensão” e amostras que já li na minha vida. Dá instruções passo-a-passo sobre como testar, medir, corrigir e melhorar a tensão nas amostras, como lavar, secar e cuidar delas, para obter o melhor resultado com cada tipo de fio. É um texto com argumentos muito fortes a favor de fazer amostras para cada projecto, enumerando as muitas vantagens com cuidado. Mas sabem o que acontece a muitos tricotadeiros e tricotadeiras (eu incluída)? Quando queremos começar um projecto ficamos impacientes, desejosos de arrancar, e essa coisa de fazer amostras acaba por ser um obstáculo no nosso caminho… e é por isso que não adoro fazer amostras. Ao ler as palavras da autora no livro, noto que encara esta etapa do projecto com uma curiosidade científica que eu não sinto; eu faço amostras porque tem de ser, e vezes há em que… mais ou menos. E é por isso que já tive algumas surpresas no meu percurso no tricot! Olhando para os meus últimos projectos, constato que tenho procurado fazer peças em que a “tensão” não é fundamental, e em que variações no tamanho final não sejam importantes no êxito da peça. É o caso da mantinha para a minha bebé, ou da gola que estou a tricotar neste momento. E é aqui que chegamos às ironias do tricot! Como estou a fazer uma gola, não me preocupei muito com a “tensão”. Como estou a usar um fio mais fino que o recomendado, optei pela gola maior, para compensar. E assim avancei. Estou a tricotar a gola Honey Cowl com o fio Trianon da Lopo Xavier, do Porto. Na sua versão original, esta gola seria suficientemente grande para dar duas voltas ao pescoço. Na minha versão, contudo, só vai dar uma. Este é um exemplo onde ter feito uma amostra teria sido útil para perceber que adaptações à receita teria de ter feito para obter o resultado desejado. Mas não o fiz, e vou ter uma gola linda, mas diferente da que tinha imaginado. Para dizer a verdade, parece até que não aprendo a lição! Mas sabem que mais? Sim, aprendi a lição; e da próxima vez que for tricotar uma peça em que o tamanho final seja fundamental para o seu êxito, irei voltar a ler este capítulo no mais completo livro sobre este assunto. A autora, June Hemmons Hiats, está de parabéns. E que me diz o caríssimo leitor sobre amostras?